I have been a bit quiet of late, having spent the last month in the UK touring around universities with Miss Chicago teen. 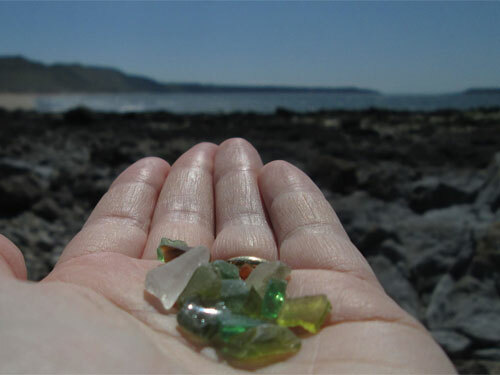 It was quite an exhausting trip but we managed to cram loads in, including a trip to the beautiful Gower peninsular in Wales, where on a tiny patch of shale I found a bumper crop of sea glass. This was my haul after only a minute or so! 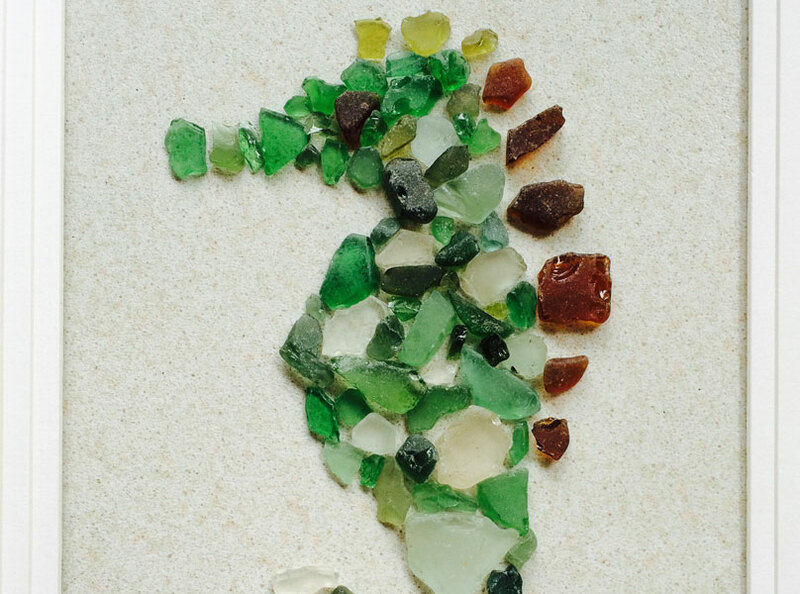 Quick as a flash Miss Chicago teen worked her magic and turned it into a spectacular sea glass sea horse. Using Elmers glue (or any school type glue) the glass was stuck onto a good card stock… the green and clear glass for the body and brown glass for the fins and eye. Here it is framed and ready to hang on the wall. 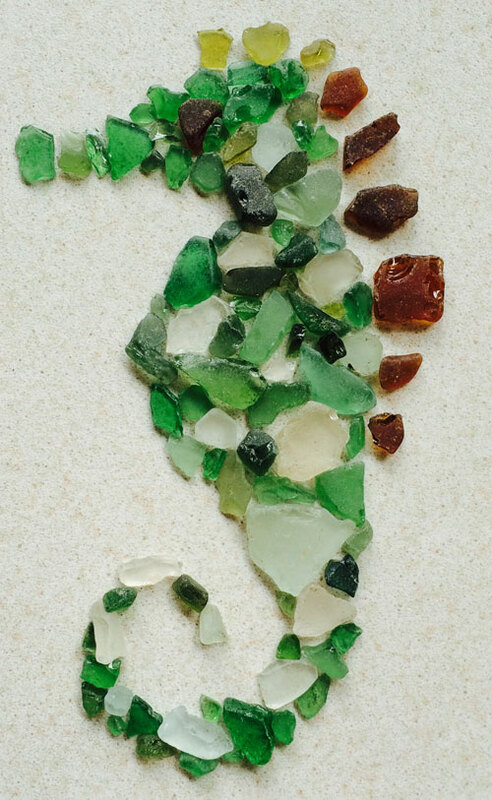 There is something quite special about a piece of art that can be made from free beach treasure. 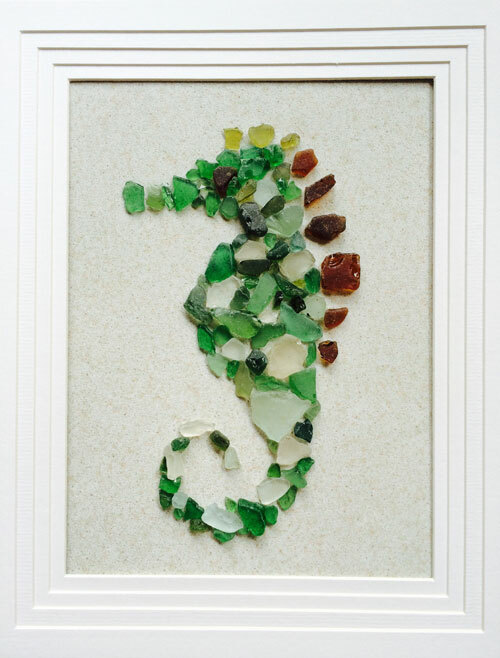 This entry was posted in Art, Coastal Crafts, Craft Projects, Home Decor, Teenager, Trash to Treasure, Wall Art and tagged coastaldecor, green, seaglass, seahorse, wallart. Bookmark the permalink. Love this, and its always so nice to collect the pieces yourself. This is a lovely momento of your trip together! Love this seahorse. Growing up my whole 50 years in San Diego, then moving to Nebraska…I am homesick or Seasick to the core. I am looking to bring hints of the ocean ask around my him. Inside and out. Thank You for sharing your ideas. Thanks you Cate! I have not lived by the sea for over 30 years but it doesn’t stop me having lots of beach inspired decor!